Musa Abubakar, who travelled 550km (340 miles) from the capital, Abuja, to vote in the far northern town of Daura, told the BBC that he "couldn't believe" what had happened. "I don't know what to do now, I'm not happy," Mr Abubakar said. There has been an outpouring of frustration on Twitter, with "postponed", "postponement" and "Inec" all trending. Many, like Bobby Ezidi, have called the electoral commission "incompetent". Others are sharing a video clip of Mr Yakubu from a recent interview where he said "there is no possibility of postponement" and wondering what had changed. 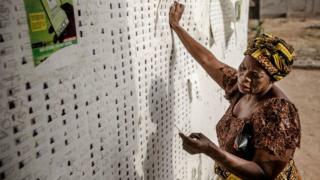 Hajiya Sa'adatu said she was "greatly disappointed" to learn of the delay when she came out to cast her vote in the northern city of Kano. In the south-eastern city of Owerri, Chukwueze (who would only give his first name) was very angry. "Nigeria has shown that it is corrupt," he said, "and next Saturday we are not going to come out." Abubakar Shettima, in Plateau state in the country's Middle Belt, had started queuing on Thursday, telling the BBC that he wanted to be the first person to vote. Responding to the postponement, he said he was still determined to come back. And in the city of Yola, in the north-east, Yucehe Ogbu said she would vote next week "because if you vote you can change things". "Canada" is another trending topic on Twitter, as people jokingly ask about the possibility of emigrating. One person wrote: "My country postpone election at 3am when the nation was asleep. Please accept me as a citizen and I would uphold your values."